Blog Hoppin': Fun with Owl Pellets! I know it is almost Thanksgiving and turkeys are on the brain but I couldn't resist doing Owl Pellets with my first graders this year! It's the new turkey! Our story of the week in our Reading Street unit was "Life in the Forest". I wanted to make it entertaining when learning about the animal life around us, so I got online and bought the pellets! I did it with my daughter and her friend just to see how it might go with Kindergartners before doing it with my First Graders. They had a blast! I purchased Deanna Jump's Owl Unit and LOVED some of her ideas. I also added a few of my own so it would go great with what we are currently learning. I found this poem that I used when I first introduced our project. We currently use poems to work on our "Phonics Chunk" identification. I couldn't find who the author was so if anyone knows, please share:) You can download a student copy by clicking HERE. Deanna also has a cute poem in her unit. We read "Owls" by Gail Gibbons which is a great informational book! We used the information from the book to complete a tree map using "have, can, and are" and then made these super cute owl books which is also in Deanna's unit. The students did some center activities with "ow". They had to read sentences around the room and write the words with "ow". Then they went back to the table and made a new sentence with the words. 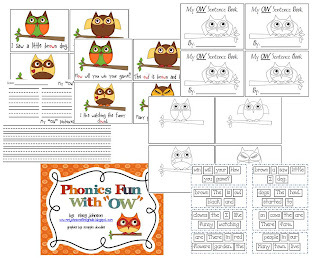 They also made "ow" sentence books by unscrambling sentences and adding them to the pages. You can download these center activities by clicking the picture link below. I hope you all have a wonderful and relaxing holiday break! I'm obsessed with owls this year so your blog post caught my eye...wow you're a brave soul! Digging through those pellets with your kiddos! I bet they had a blast and won't forget it!